Over the past two days my wife and I have traveled through the Sinai Peninsula. 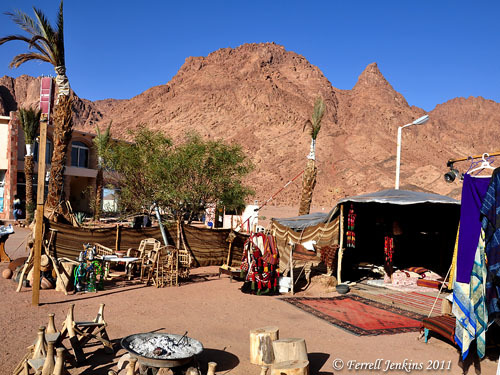 We left Cairo Tuesday morning and traveled somewhat along the traditional route of the Israelites in the wilderness to Jebel Musa (Mount Sinai/Horeb). Tuesday night we stayed at the Morganland Hotel near Saint Catherine’s Monastery. This photo was made Wednesday morning from the hotel grounds. View of the granite mountains of Sinai. Photo by Ferrell Jenkins. After visiting Saint Catherine’s Monastery, we continued east to the Gulf of Aqaba/Eilat to Tabah, Egypt. Then, moving north, we crossed into Israel at Eilat. We were traveling in a van. The trip from Sinai to Tabah took more than 2 and 1/2 hours, but by the time we cleared all of the customs things in Egypt and Israel it took a total of 4 hours. We enjoyed the two weeks in Egypt, but delighted to be in Israel again. This entry was posted in Bible Places, Bible Study, Egypt, Israel, Old Testament. Bookmark the permalink.